Imagine waking up in a train station in India with no idea who you are or how you got there. This is what happened to David MacLean. In 2002, at age twenty-eight, David MacLean woke up in a foreign land with his memory wiped clean. No money. No passport. No identity. Taken to a mental hospital by the police, MacLean then started to hallucinate so severely he had to be tied down. Soon he could remember song lyrics and scenes from television shows but not his family, his friends, or the woman he loved. All of these symptoms, it turned out, were the result of the commonly prescribed malarial medication he was taking. Upon his return to the States, he struggled to piece together the fragments of his former life in a harrowing, absurd, and unforgettable journey back to himself. 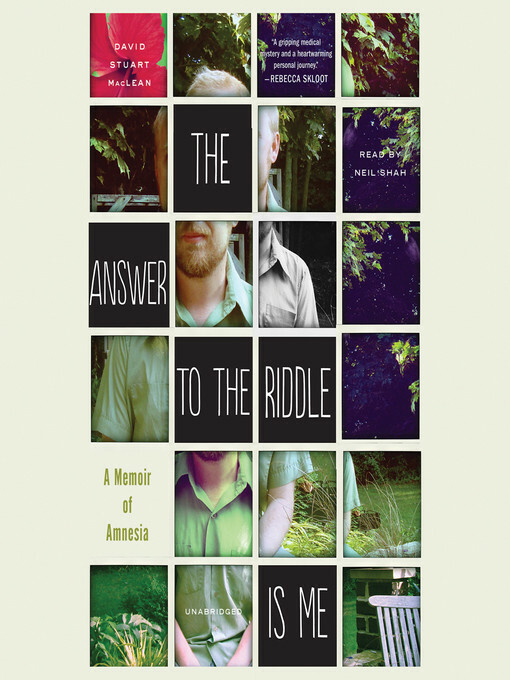 A deeply felt, closely researched, and intensely personal book, The Answer to the Riddle Is Me, drawn from MacLean's award-winning This American Life essay, confronts and celebrates the dark, mysterious depths of our psyches and the myriad ways we are all unknowable, especially to ourselves.